Council bosses have called a halt to unauthorised work in an Aberdeenshire community. Concern had been raised locally about the site at Bruntlands, Whitecairns, being used as a quarry. Following investigations, the council has issued a temporary stop notice to prevent any further excavation. Planning permission exists for the construction of a large building, hard standing and significant re-profiling of the hillside. However, planning and environmental health services began a probe after complaints from the local community about the extent of works being undertaken. They found that, while elements of the development have progressed in accordance with the planning permissions granted, significant engineering operations have taken place which are not covered by the approval. 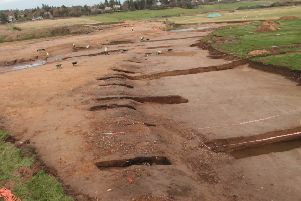 The unauthorised work relates to the formation of a borrow pit at the top of the hill and the excavation of material below the approved slope profiles. Investigations have shown the work is a breach of planning control and the council stepped in on Friday to stop operations. A further notice will be served in due course to seek the resotration of the borrow pit and slope to ensure that the hillside is reprofiled in accordance with the planning approval. Head of planning Robert Gray, said: “This notice requires the unauthorised work to cease with immediate effect and has been served following our own recent investigations and complaints from local residents. An update on the situation is being provided to local councillors, the community council and all those who have previously made complaints in relation to the site.